The time is nigh. Tomorrow before daybreak I’ll be at the Pelican Ball Field with hundreds of other people waiting for the BOOM that signals the beginning of the Myrtle Beach Marathon and Half-Marathon. Before that, we’ll sing the National Anthem and stand around making small talk and listening to the conversations around us. I’ve participated enough in these events to know that there will be people who are at the top of their game and ready to take off running. They’re at the front of the pack, stretching and checking out their competition. Others, like me, will be feeling a bit anxious as they wonder what it would be like to come in last. I’m not too good at statistics, but I’d say about half of the participants will be coming up excuses about why they aren’t going to do as well as they’d like. Sometimes it’s weather, and often it’s work, family matters, or sickness. Whatever the reason, I understand their motives and fears. I wish I were faster. I wish I could finish with no discomfort. Nothing’s certain, though. The only thing I know for sure is that I’ve put in the miles. I’ve walked downtown in residential areas, along Ocean Boulevard, at the local track, around our neighborhood, beside busy highways, and down less travelled roads. I’ve pounded the pavement in all kinds of weather, even a little snow and rain. When it would have been so much easier to sit back and take the day off, I remembered Nike’s advice to Just Do It. Still, I’m a little anxious, and when those moments of doubt or fatigue come, I’ll remind myself of another platitude: Inch by inch, life’s a cinch; yard by yard, life is yard. I’m going to take my husband’s advice and put one foot in front of the other and keep on keeping on. I often remember my first full marathon. It was in Alaska in 1997, and I went with 40+ people from the Myrtle Beach area who were part of a Team in Training group. All of us were committed to our united cause of raising money for leukemia research. One of my favorite images is of a female lawyer from Myrtle Beach who walked steadily and resolutely all the way to the finish. She didn’t appear to be overwhelmed by the distance the way I was. Alternately walking and jogging, my technique didn’t work as well as her steady, consistent gait. One of my favorite psychological terms is self-efficacy, the belief that you can make something happen, the knowledge that you have what it takes to be successful. Interestingly, psychologists feel that perceived self-efficacy can be more important than a person’s actual ability. This is true in many areas, but on Half Marathon Eve, I’m only concerned about walking 13.1 miles. I think I can. I hope I can. I know I can. I’ll be looking for the cheering sections on the route tomorrow as I “just do it.” I know that if I take it step by step with the confidence that I can finish, I will. I’d love to read of other people’s advice, stories, or experiences with any kind of walking, jogging, running event. Did you have any special challenges? Did you find that old proverbs or clichés helped you? Words are powerful. They can lift and inspire us, soothe and comfort us, and hurt and humiliate us. It can be one simple word like “Loser” tossed our way or it could be a series of words like, “You can do it!” Knowing the power of words on a person’s psyche is probably what convinced me to buy the little sign above. My book was going to be available in a matter of days, and I was feeling concerned about how it would be received. Would people laugh, scoff, call me names? Although worrying about people’s reactions was a waste of time at that point, I couldn’t help it. In need of a little confidence, I spied the above sign while browsing through a neat, eclectic store with my sister-in-law and niece. I picked it up and smiled, knowing it was going home with me. The tiny wooden sign now sits in my window, a reminder that while not everyone will like what I have to offer, somewhere someone will. Naturally, the message has numerous other applications. For the person who’s afraid of starting a new career, meeting new people, or opening a new business, somewhere someone is looking for exactly what that person has to offer. If you don’t change careers, who will provide physical therapy for those people who can respond only to you? If you don’t relocate to PA and open a daycare center, who will take care of those darling kids while their moms work to bring home some bacon? If you don’t dance in the community theatre’s production of Oklahoma, how will that someone be entertained in the way that only you can entertain? Who will landscape the city park, write the primer on how to use social media, paiant the mural, or open the bookstore/bakery if you don’t? Businesses, books, songs, and services are the only things that somewhere someone is looking for. People are looking for YOU. It’s not much of a stretch to think of these words in terms of personality and the whole “person package.” Whether romance or friendship, someone is looking for exactly what you have to offer. I don’t expect anyone who reads this blog to go out and change his or her lifestyle, at least not right away. However, I hope that seeing and thinking about these words will give someone the confidence to KNOW that what he has to offer is valuable and good, very good. Chin up. 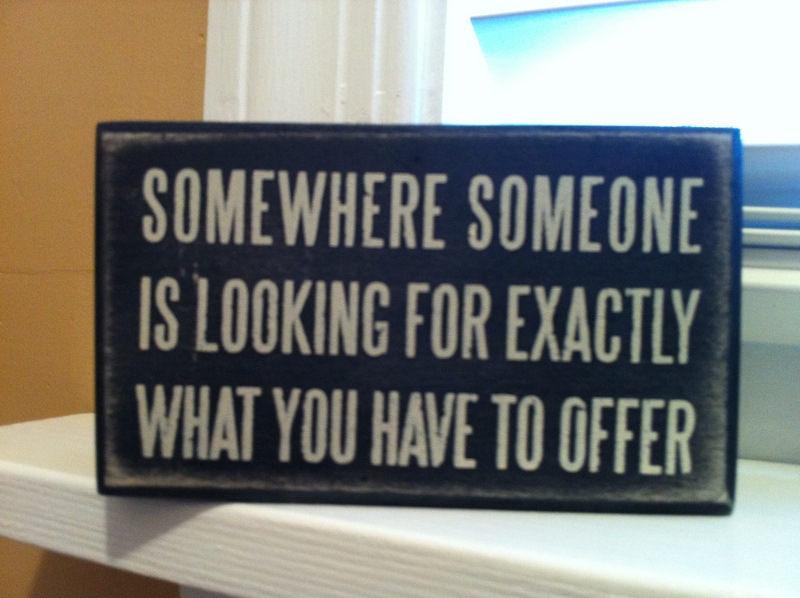 Somewhere someone is looking for exactly what you have to offer. Doesn’t that give you a little boost of confidence to go forward with your dreams and ideas?